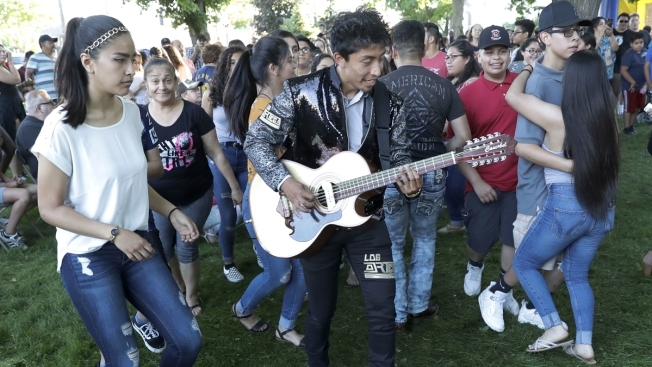 The lead guitarist from a local latino band leads a conga-style line of couples during the First Fridays street festival in Goshen, Ind., on June 1, 2018. Participants in the monthly gathering represent the diversity of the county, which recently wrestled with whether to host a U.S. Immigration and Customs Enforcement detention facility. The sermon had been preached, the last prayers offered. Now, Mike Yoder decided, the time had come to share unsettling news. As congregants at Silverwood Mennonite Church chatted around a potluck spread, Yoder, a Republican county commissioner, huddled with Pastor Jeremy Shue. There was a good chance, Yoder confided, that a 1,200-bed immigration detention center would soon rise north of Goshen, Indiana. "One of the only positives is that it would be less of a drive to protest," Shue said. Yoder had paid attention when Elkhart County voters backed Donald Trump for president after a campaign lambasting immigrants. He knew, too, that the county seat and the largest employers had made a place for thousands of immigrants, a number in the U.S. illegally. The detention center proposal was "a microcosm of all the different issues of immigration, right here in this county," he said. Since 2011, contractors have proposed detention centers in seven communities near Chicago, with activists pushing a number to defeat. But demand has increased as the Trump administration steps up arrests. 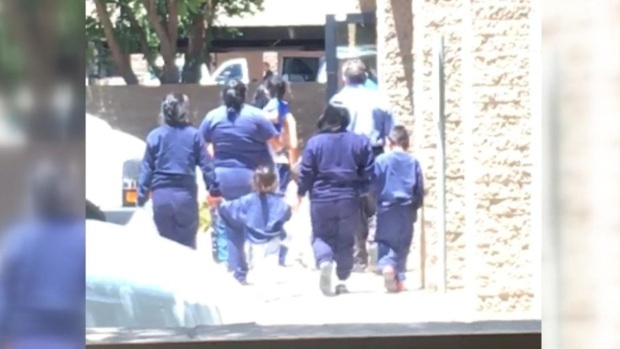 Immigration and Customs Enforcement doesn't own most of those facilities, instead contracting with companies whose for-profit lockups hold two-thirds of immigrant detainees; others are held in local jails. Last fall, ICE requested new detention sites. CoreCivic Inc., one of the largest private prison companies, proposed Elkhart, two hours east of Chicago and the hub of the booming recreational vehicle industry. With 9,000 local job openings, immigrants have helped fill the gap. Yoder recognized some residents would object to a detention center. But new jobs and taxes would make it hard to reject. Many Republican voters would back it. If a facility was likely, Yoder told Mennonite pastors, maybe it would be best to have it where clergy could minister to detainees. He also was mindful of the growing Latino population, about 16 percent countywide and twice that in Goshen. So the same day he spoke to clergy, Yoder met with Goshen Mayor Jeremy Stutsman, immigration activist Richard Aguirre and others. "I'd really like your help communicating calmness," the commissioner said. "My reaction was, 'No way!'" said Aguirre, a Goshen College administrator. Aguirre recast a pre-Thanksgiving rally, planned to celebrate new ID cards for immigrants, as a protest. "I want you to raise your hands if you believe that we do not want an immigration detention facility in Elkhart County, Indiana!" attorney Felipe Merino urged the crowd. 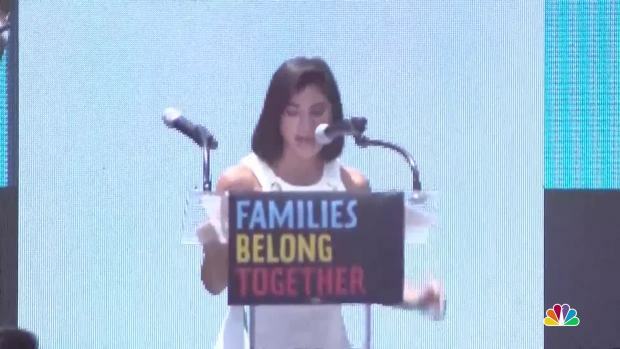 "Orange Is the New Black" and "Jane the Virgin" actress Diane Guerrero, speaking Saturday at the Families Belong Together rally in Washington, D.C., shared the story of her own family's separation and demanded change for immigrants today. On Dec. 17, worshippers from many congregations filled an Elkhart church. "Whether or not our government builds a bigger wall to keep immigrants out, God's church is about breaking down dividing walls," preached Neil Amstutz, pastor of Waterford Mennonite Church. But many immigrants were apprehensive. When 19-year-old Lizeth Ochoa first heard about the detention center, she imagined a lockup filled with criminals. "Then I realized, oh, it's for people like me," said Ochoa. When Ochoa was 9 months old, her mother paid a smuggler to spirit them from Mexico. They joined her father, who had found work in Elkhart. 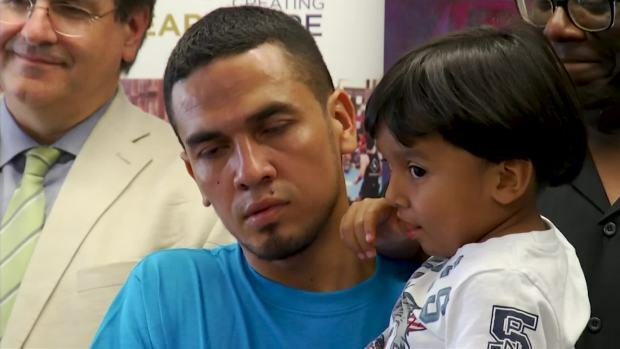 President Barack Obama's Deferred Action for Childhood Arrivals initiative had eased worries about deportation, but Trump was pulling the plug. Ochoa and her parents avoided talk of the detention center. But quietly, she considered what they would do if ICE officers knocked on their door. To others, though, a detention center was just what the county needed. A decade ago, Bob Schrameyer and fellow Goshen residents lobbied police to partner with ICE and pushed employers to vet workers' legal status. The problem, Schrameyer contends, is that many immigrants don't pay their share of taxes, while collecting welfare benefits. The detention center "was a no-brainer," Schrameyer said. "We have a Constitution founded on the principles of God, and a lot of them, the illegals, they don't have that," said Roland Weaver, who lives near the project site. "That's what waters down what this country was founded on." At a holiday gathering, Mayor Stutsman talked with retired cardiologist Mark Smucker and poultry company owner Galen Miller. "The argument I made was if we ever solve our problems with immigration in this country ... at some point we aren't going to need an immigration detention center," Smucker said. "It seemed to me that the people in the RV manufacturing community would not like to see even more of their workers drift away." Stutsman, a Democrat, proposed a letter of opposition. Miller agreed to reach out to RV executives. Many are conservative but count on immigrant workers, some in the U.S. illegally, said Jim Siegmann, former owner of a printing company. "They know they couldn't run their businesses without them," he said. On Jan. 17, CoreCivic officials met with executives from RV companies and other big employers. Local executives declined to comment or did not respond to calls or emails. But people who attended or spoke with those who did said they were very direct. "I do business here. I've been here my whole life, and I don't want you to come here," Forest River Inc. CEO Peter Liegl is said to have told the visitors. The next day, Stutsman released his letter: "Any tax dollars generated by the project wouldn't be enough to offset the long-lasting damage such a facility would do to our county." Yoder counseled CoreCivic to think things over. "After careful consideration," a company official wrote, "CoreCivic has decided to withdraw its application." "We won!" Aguirre posted on Facebook. "We won!"